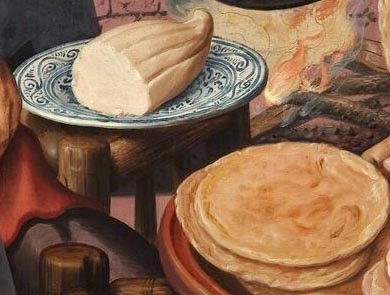 Have you ever wondered what these objects were in the Dutch market paintings? Butter was sold in various shapes, sizes, weights and 'prints' over the centuries. 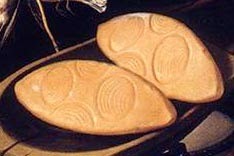 The following Dutch and Flemish butter images from the 16th and 17th century show imprinted oval shaped butter. The form of the butter is made by taking a suitable quantity and pressing it into a mould, and then taking it out by knocking on the mould. Many different forms of butter-moulds are in use in the different sections of Holland... Each region has its own peculiar stamp, or special figures, which are given to lump-butter, to which particular attention is paid by the purchaser. The butter-dealer knows exactly that in one section butter is stamped in one way, in another section in some other way; and that the butter of one section, with its peculiar stamp, is worth more than that of another. 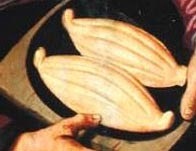 The butter-moulds are generally made of linden-wood, but must always be large enough to hold at least a certain prescribed weight of butter; for all lump-butter brought for sale to the weekly market must be of a prescribed weight. This weight is very different, and almost every city has different regulations and market customs; yet, in most places, a pound is the legal weight. The images are from paintings by the Dutch painter Pieter Aertsen (1508-1575) and Joachim Beuckelaer (1533-1574) from Belgium. The black and white engraving, with tools and butter was done by the Frenchman Nicolas Larmessin (1638-1694). I hate to tell you, but those are more likly to be a cheese instead of butter. I have done a indepth study of these particular images from the paintings and if you look at the pictures of the cut ones you can see the airholes in them like a good swiss cheese or several other varieties of cheeses. While I can see why you might think these are butter, with more study and research you would come to the same conclusion that it is more likely a cheese. And, while the last painting does have the cheese in it, the picture you have singled out is actually breads in the baskets. the cheese or as you say butter is further over to the right of the painting, at the bottom by the chair and the other cheese rounds, on a plate, and by the wooden planks behind the chair. The breads of the time period are in the same shapes as the cheese, just rounder and with different markings. Butter or Cheese? What do you think? There are many reasons I still believe these images are butter. First, the lady with the scales and butter, by the French engraver Nicolas Larmessin, is called la Beuriere – and Beurre is French for butter. But the most important reason is because Peter Rose, who has studied Dutch paintings and cooking for decades and is the authority responded to my email (sent after I got the comment from anon) and said they were butter. Butter was printed with various designs to distinguish the seller or for decorative purposes, and was made in different shapes. While I have made butter for many years, I have only made a few types of cheese and can’t imagine any of those cheeses having a ‘print’ on every top. Or how they made the cheese with the two long end points. The texture, color and sheen are different. An upcoming post on more butter shapes will have other butter with cheese images to compare. 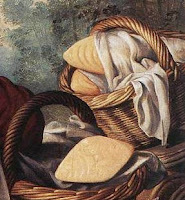 Butter packed in cloth can be seen in a Lewis Miller image and in early writings. Thomas Moore’s 1803 refrigerator (a previous post) held 22 one pound bricks of butter each wrapped in "linen cloths as usual." The image up top changes to show several incarnations of the particular shape you explored here.